Today has been a brilliant day.. the weather is awesome (82 right now!) and Gemma and I have had a great day even considering we had to go to the dentist! She did great and didn’t shed one tear! I wanted to share an ongoing project that I started last Spring and am just now really getting into. We are lucky enough to have this really cool fenced off side yard that is shady almost all year-long. It is quickly becoming one of my favorite attributes of our property because it has so many wonderful possibilities. I have ambitions of this space becoming a cool lounge spot for my husband and I to share the occasional glass of wine and quiet dinner (haha, literally laughable with the prospect of two toddlers!). It is a great location because it is immediately adjacent to my girls’ play space and the kitchen but yet it remains its own secluded garden area and it is a nice cool relief even in the heat of over 100 degrees that frequents our region. 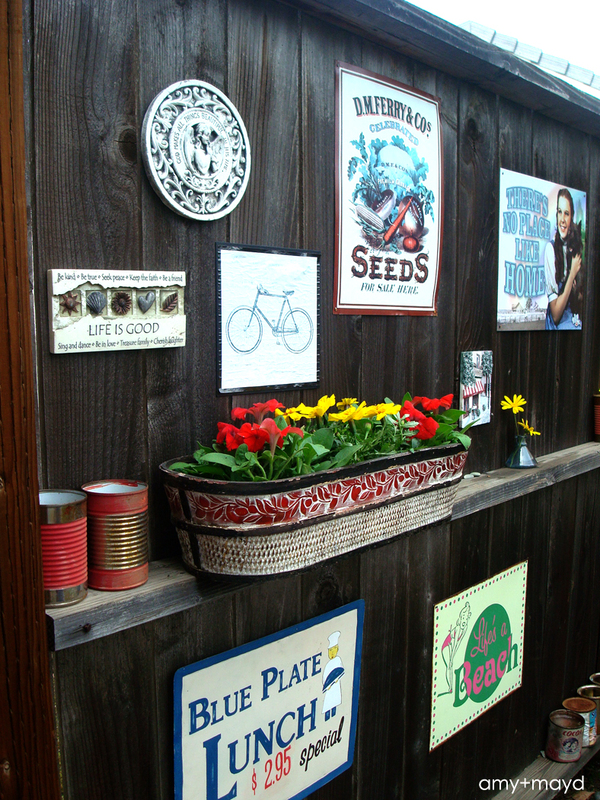 So the first phase of claiming this space has become a tin sign collection that I have mounted on the fence you see as you enter the space. I picked all of these signs up from antique stores over the past few months and some I have had for a few years. I didn’t really care about them matching, I just wanted a collection I like looking at; hence the large variety. 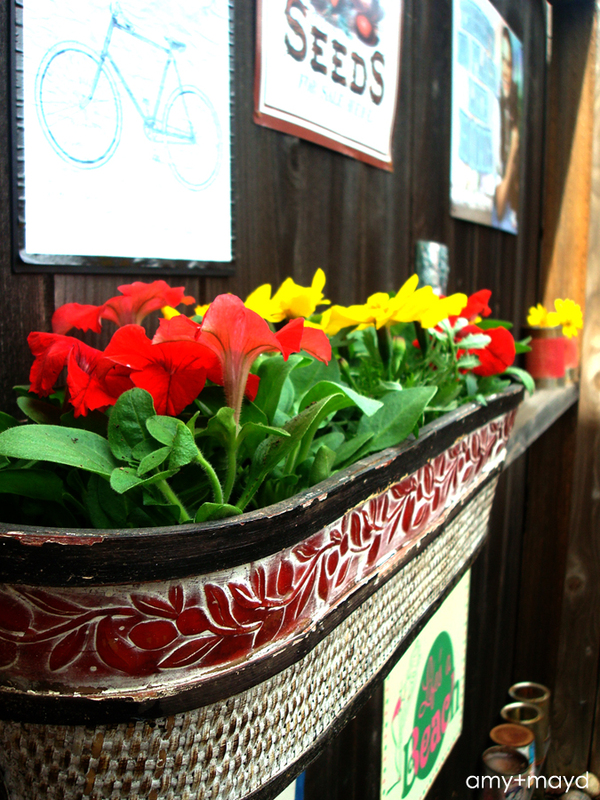 I also mounted this wooden flower basket that I received as a gift a few years ago and added some annuals to give the fence some color. 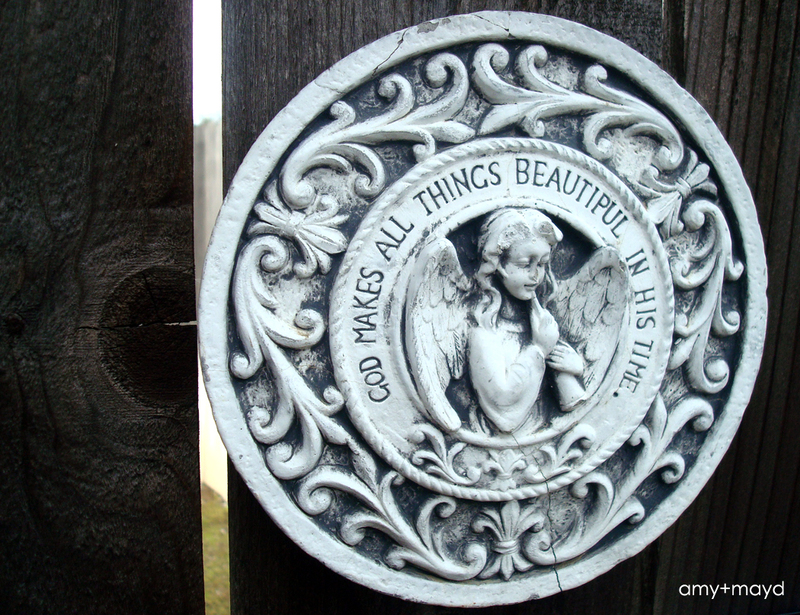 My favorite piece is this beautiful ceramic angel wall hanging I found at a downtown shop for only $6.00!!! What a steal! So this is just the beginning but I wanted to share that I have made a little progress. 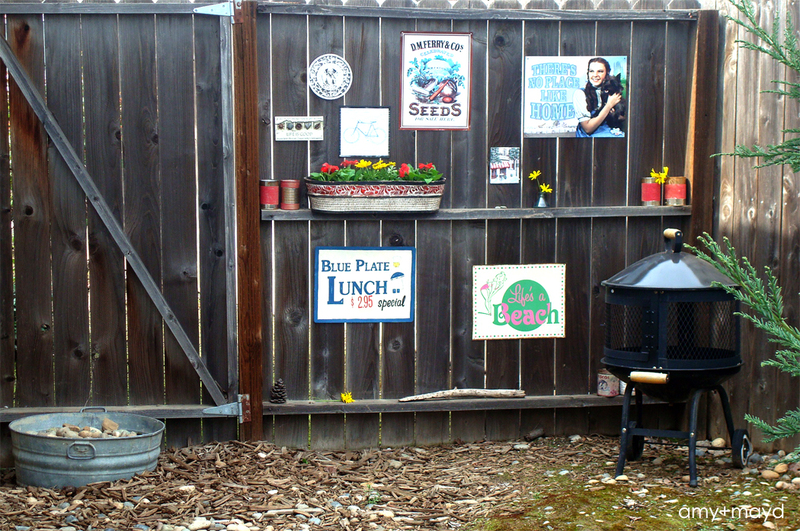 I have high hopes of planting some shade plants and ferns; finishing off the other fence, and even creating a small patio for a garden bistro table. Wish me luck on finishing it before baby girl comes in June… ahhh the countdown is on!